I haven’t written a link building post in a while, because for the most part, I was off investigating other things. And getting way too complex. When I realized it’s the things I think are simple and run-of-the-mill that people really are looking to learn about. So as people ask me questions, I note them and try to write a post. I used to hate questions. Taking someone from “What’s a signature?” to viewing browser source in one sitting may be hard, but hopefully, it’s not impossible. Now I realize these questions are the master key to the type of traffic I want at this blog. So off we go. Forums are basically where “social networks” started. I talk to a lot of people who want to get traffic to their site. And they usually think I can tell them how in 10-15 minutes. So I try. Rarely do people listen. And out of those that listen, very few actually use what I tell them. I am not sure why this happens. Maybe they are lazy. Maybe they think, “How can something like that help me?”. But one guy I talked to I told to use forum signatures to build links. That was about all. I thought it was simple enough to get someone started. I told him to sign up for forums, add a signature file, forget about it and just converse. Put in your two cents where ever you can add something to the conversation. I did not list specific forums. I told him that and I was thinking, yet another person not taking my advice. But I was wrong. A few weeks later, he came back to me and we checked the site. He has a micro business and is outranking local corporations here in Kansas City. He is doing this with a site built from templates. He doesn’t even know HTML. And what he used to do it, local business directories and forums. It blew my mind. One, for getting through to someone in 10 minutes. Two, for the results. And since most people understand forums, I think it may be the best place for the average non-tech person to build links to his site, especially if you have the gift of gab. They have been around since they were called bulletin boards and some still are. You can find multiple forums on just about any topic you want. There are many ways to get links to your site and links are votes. That is about the simplest way to think of them. Think of them as another site voting for your site to rank higher than other sites for a specific keyword. He who has the most votes, all else being the same, will rank the highest. It is not that simple and not the whole story, but if you are new to this, it is a good place to start. Most other ways of getting links will get you one link from one site. You comment on a blog that uses dofollow and you get one link back from that post. You submit an article to an article directory and you get one link, most of the time. Run down the list of link building methods and it takes a lot of work to get one link. With forums, once you create a signature, that signature will now be under every post you add to a forum thread. Remember that the links to your site count as “votes”. Well, in the early days of blogs, getting a link to your site was as easy as commenting on any random blog you happen to find. It was not long before spammers caught onto this. To prevent spam, the “nofollow” tag was created. A normal link in html looks like this: <a href=”http://www.website.com”>This is your link text</a> and a “nofollow” link looks like this: <a href=”http://www.website.com” rel=”nofollow”>This is your link text</a> . That rel=”nofollow” does a lot. What it does is tell the search engines that happen to spider that page this link is not a vote for your site. In other words, the link is worthless for your rank in search engines like Google. There are some people that say this link still counts as a vote with a lesser value, but if you are new to this, we will stick to this rule: if there is a rel=”nofollow” around your link, it is worthless for building your rank in the search engine results. If it is a high traffic forum, people may click on your link but it is not helping you anywhere else. It’s value is limited to those clickthroughs. Okay, let’s see if a forum is passing rank. Browse to a thread in the forum of your choice and make sure there are some signature showing. To detect if a forum is using nofollow tags, first right click in the middle of your browser’s window. On a Mac, this would be Control and your normal mouse click. After doing that, a menu should pop up for you. Now depending on your browser, you should see something like “View Page Source” or just “View Source”. Click that. Now that you are looking at a bunch of html code, the easiest way to determine if a forum is dofollow is just search the whole page for “nofollow”. Ctrl+F usually brings up a search menu on most browsers and you can do this with source code. So push Control and F at the same time, type “nofollow” and hit enter. If nothing comes up, you are at a dofollow forum. If your search does turn up a “nofollow”, check it to see if it is around one of the signature links. People nofollow links on their site for various reasons and some other links on the page may be nofollow. To make that a bit easier, go back to the real page, copying one of the signature links, search for that on the html source (the page we got by right clicking) and determine if the signature link itself has a nofollow tag. And there are Firefox extensions that make this easier. But if you are not using Firefox and are not used to addons, showing you how to use them would have made this post a lot longer and involved, so I skipped that process. And most forums I have run into are dofollow, so the manual process of right clicking and viewing the source may be overkill, but it helps to know before you invest in creating a profile there and fleshing it out. This will be a general tutorial and some forums are set up differently then others, so you may have to do some looking around to edit your forum profile. Usually on a bar, across the top of a forum, you will see various links like Forum Jump, FAQ, Search, Tools. There should also be a “Sign Up” or “Register” link. Obviously, this is where you sign up. Do that first. Most are basic forms and most will send an email to the email address you used to sign up. You will have to click on this link before your forum membership is activated. Once you have determined that the forum will follow signature links, you have signed up and you have activated your account, it is now time to add your signature and flesh out your profile. Look around on that top bar for something that says “Edit Signature”, “Edit Profile”, “Control Panel” or something similar. While you are in there, you might as well fill out your whole profile, because it will get some traffic from other forum users especially if you are active and on most forums, every post you make will also link back to your forum profile. Before the critical mass of blogs, if you searched for a very specific question on just about any topic, forums showed on the first page of results at Google. Now, chances are that blogs have taken that place in search engine results. But forums are out there and some still outrank the blogs. Should you find forums related to your niche? Yes. That will give your most valuable backlinks because the content on both the forum and the site you are linking to in your forum signature are related. But if you find that this limits the amount of forums you can be active on, branch out to other forums and use them also. For example, if you only found 3 or 4 forums on “window and door repairs”, make sure you are active at those forums. But if you have more time, go to unrelated forums and add your signature. And if you do, you might as well find ones on topics you like and can gab about for days. Most webmaster forums are full of members with signatures that have nothing to do with being a webmaster. The members still talk about webmaster things. But their signature point to unrelated sites. One of the easiest ways to find forums is to use a keyword related to your niche and add forum to the end of it. Then search Google for that phrase, i.e “webmaster forum”. Basic and simple. I was going to build my own and still might, but there is a lot of forums out there and it is rare to run into one that does not give you a dofollow link. So instead I will lead you to other blogs. Use this list if you are lazy. These forums have already been checked for dofollow links. Just don’t. That’s about it. 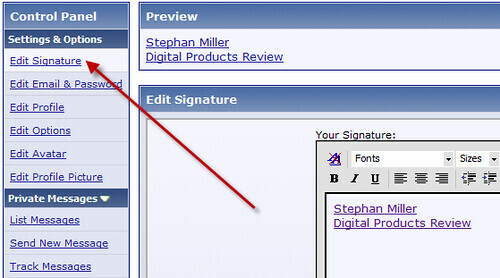 The beauty of your signature at a forum is that you can forget about it. Do so. And start conversing. It may take a while. It’s like driving. At first, you stress out, thinking Step 1, Step2, Step3. But eventually, you’re a natural. Don’t look for opportunities to get links. Just about any forum you land on will have hundreds of active threads. Browse them until something strikes you. Answer questions. Ask questions. Post tips. And mainly watch the other forum members. Learn from them.